Planning for the development of the Brooke County Emergency Medical Service began in the Spring of 1973. At that time, new legislation was passed in West Virginia placing the responsibility of having an adequate EMS system in each county of the state to the commissioners of each county. Before this time, the ambulance service was in fact the funeral home. James, Chambers, and Carte Funeral Homes were the medical service before 1973. Although, these funeral homes did not want to have to conform to the many new EMS laws that were coming out at the time and decided to leave the business behind. Two ambulances were donated by James and Chambers Funeral Homes, a Cadillac and a Buick. The keys to these vehicles were passed over to the members of the new Brooke County Emergency Medical Service on Easter Sunday at midnight in 1974. 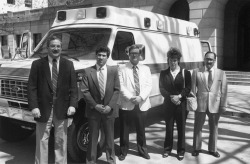 The first call on record for the ambulance service was on March 31, 1974. It was to the Follansbee Police Department where an officer was pushed through a plate glass door by a prisoner.